Der Artikel David Popper (1843-1913): Etüden op.73 Nr.1-40 für Cello solo wurde in den Warenkorb gelegt. 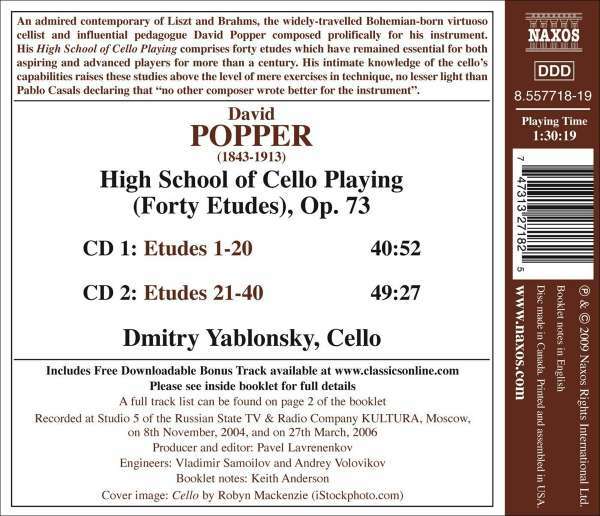 An admired contemporary of Liszt and Brahms, the widely-travelled Bohemian-born virtuoso cellist and influential pedagogue David Popper composed prolifically for his instrument. 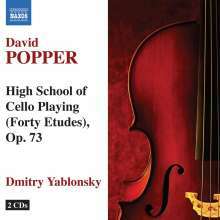 His High School of Cello Playing comprises forty etudes which have remained essential for both aspiring and advanced players for more than a century. His intimate knowledge of the cello's capabilities raises these studies above the level of mere exercises in technique, no lesser light than Pablo Casals declaring that "no other composer wrote better for the instrument"." Hörprobe Track 17: Hohe Schule des Violoncello-Spiels (High School of Cello Playing), Op. 73: Etude No. 37 in E major, "Study in Mordents"
Hohe Schule des Violoncello-Spiels (High School of Cello Playing), Op. 73: Etude No. 37 in E major, "Study in Mordents"
Hörprobe Track 20: Hohe Schule des Violoncello-Spiels (High School of Cello Playing), Op. 73: Etude No. 40 in D major, "Study in Harmonics"
Hohe Schule des Violoncello-Spiels (High School of Cello Playing), Op. 73: Etude No. 40 in D major, "Study in Harmonics"